In 1973, I first became a baseball fan. My father — once a diehard Dodger fan in the 40’s, 50’s and early 60’s — had drifted away from the game. 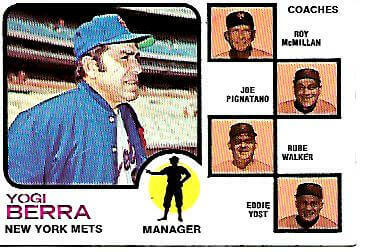 But in August ’73, we both began to follow the unlikely rise of the New York Mets managed by Yogi Berra, climbing from fifth place to Eastern Division Champions. Listening to games on the radio driving down to Woodstock where my grandmother had the TV ready in her summer house where she bemused hippies with stories of performing in the Dybbuk on the Hebrew Stage in Moscow in the midst of the Russian Revolution. As the Mets were managed by the uber-Yankee who had ruined many of my father’s October early evenings, he was hesitant to bandwagon. But with Willie Mays — who had joined the Mets in ’72 — in his last season saying his say hey kid goodbye and Tom Seaver being Terrific and Tug McGraw’s epistemological chant Ya Gotta Believe and Yogi uttering with teleological certainty It Ain’t Over Till Its Over, the bitterness of ’41 when my father’s waving of his lucky bat in a Manhattan apartment failed to prevent Mickey Owen from dropping the third strike took a holiday. That October marked my first post season. At the time, chess was my passion and I remember watching at a tournament in the old downtown YMCA with the TV in the background the Mets playing the Cincinnati Reds in game three of the National League Championship Series. In the fifth inning the Red’s Peter Rose sliding hard into the Met’s slightly built shortstop Bud Harrelson and the two tussling at second base. The everyman Bud vs. the narcissist thug Red Rose (to blue Met fans). Players from both sides joined in a general melee lasting for several minutes, setting off the rowdy fans at Shea who showered the field with bottles and debris. Myself too young in 1973 to guess the psychedelic happenings in the grandstands but no doubt just a few months earlier many of the Met’s faithful had been among the 600,000 who descended upon a race track at Watkins Glen for a summer of love weekend with the Grateful Dead. Gratefully, Willie knocked in the winning run in the fifth game with a bouncer over the mound. And it was on to the Fall Classic. In the World Series, Yogi’s boys took the Oakland A’s all the way to the seventh game. 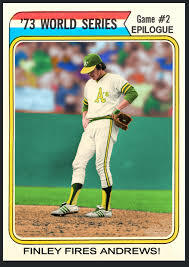 In between, the A’s owner Charlie Finley tried — but was not allowed — to “fire” his reserve second infielder Mike Andrews after two fielding errors that left Andrews wandering in existential fallenness near second base. 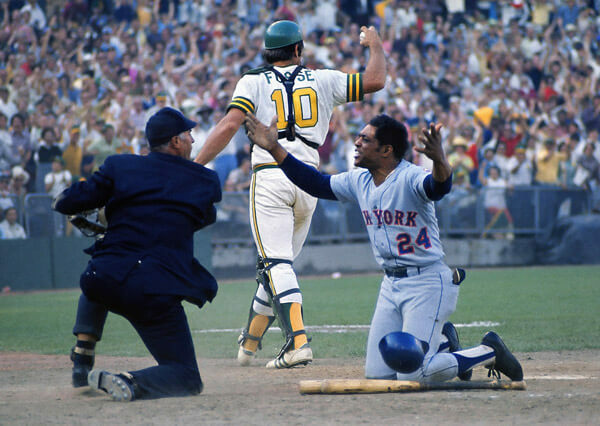 And Willie pleading with Mephistopheles to turn back time when Ray Fosse got the call. And Rollie Fingers, whose autograph I would years later get at Frontier Field, pitching brilliantly in relief. Then game seven. The Mets behind by four in the ninth gamely making an It Aint Over comeback. My father and I watched Yogi meditating on when he should bring in Mays, who was on the bench, to pinch hit. 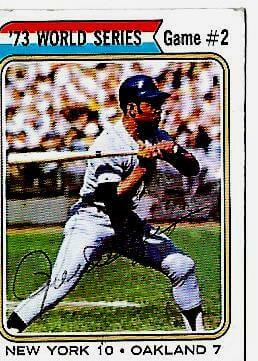 Finally, we, millions of others, and Yogi watched as Mays came to the on-deck circle on the precipice of his career. Dear God, give me one more swing. Yogi once said if you come to a fork in the road, take it. But the Met’s batter made out. It was over. And the last World Series — winner of ten — for Yogi. 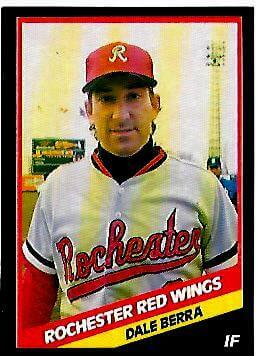 About ten years ago I purchased a box of 1988 Rochester Red Wings baseball cards that included Yogi’s son, Dale. I had forgotten about Dale. Looking him up, I relearned that in the late 70s and 80s he had been involved in the cocaine epidemic finding its way into baseball clubhouses, especially the Pittsburgh Pirates. Dale was indicted for his role but later the charge was dismissed. We don’t know how deep was Dale’s addiction or how much it effected his ultimately mediocre career. Or how much Yogi knew. 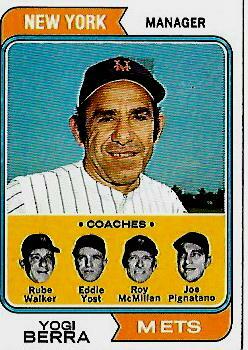 But we do know that in 1985 when Yogi was managing the Yankees he invited Dale to play for him (which Dale did for one unmemorable season). Apparently no questions asked. 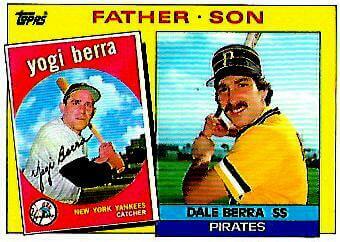 And that over the years Dale worked closely with his father helping to manage and promote Yogi’s business enterprises. 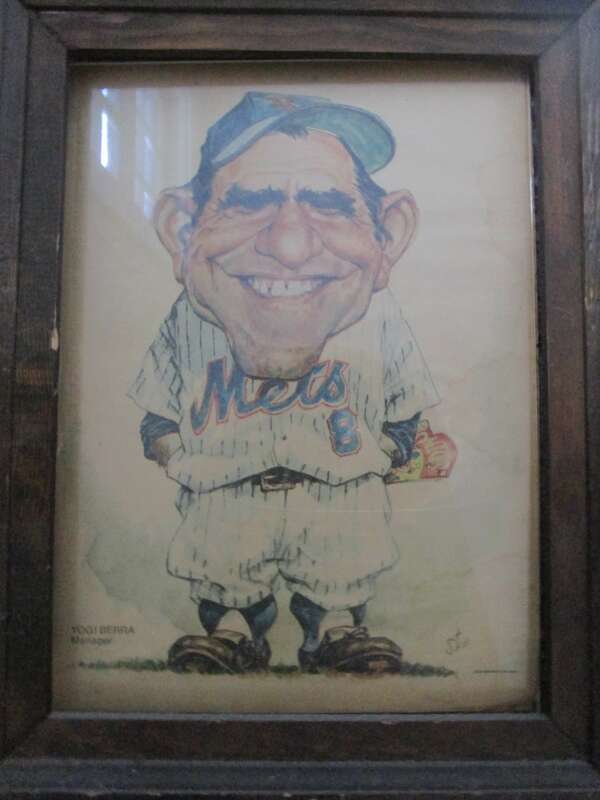 On my father’s 80th birthday I got him the framed picture of Yogi taken from a newspaper. For those of you who know Eugene, he had a non profound stroke in April and is recovering with hard work. We all hope he makes it — like Yogi–to 90. It ain’t over till its over.